Recent news and/or miscellaneous ramblings about our products. Apple’s superb mac OS Mojave (10.14) has a few extra security features. 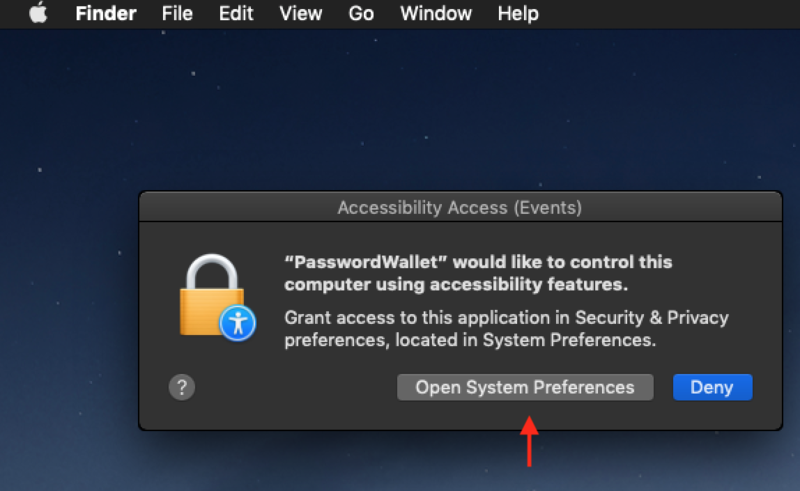 Before you can auto-type your username and password in to any application on Mojave, you’ll have to grant permissions to allow PasswordWallet to auto-type. 1. The first time you auto-type, you’ll be presented with the following prompt. Click “Open System Preferences“. 3. Once done, PasswordWallet will be able to auto-type on Mojave! We now have a completely native and awesome version of PasswordWallet for Android! This baby reads and writes the same wallet data the Mac, Windows and iOS version of PasswordWallet do so you can share all of your data and changes easily. No fuss, just security, auto-typing and more. PasswordWallet 4.8.8 brings some great new features for iPhone, iPad and iPod Touch users. We held back 4.8.7 because we had to use the extra time to finish up our new Dropbox support. PasswordWallet for Mac now requires macOS version 10.10 or later. Our very first product, SmartWrap, just got a much needed update. The “smart” text cleaning application now works on 10.12 and its full 64-bit on macOS 10.12. The upgrade is free for all owners of SmartWrap 2.x! 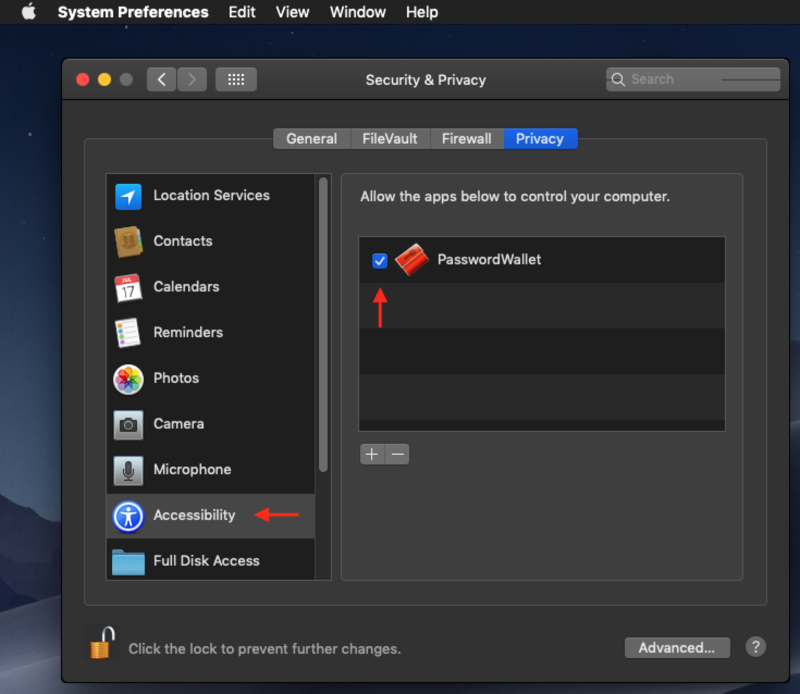 If you’re running Mac OS X version 10.9 or later and PasswordWallet 4.8.4, it is critical that you upgrade to version 4.8.5 of PasswordWallet for Mac OS X. 1. Our automatic update mechanism fails silently. 2. A few hours ago we discovered an inadvertent security hole and fixed it immediately. Please download and install the latest version of PasswordWallet from the URL below. These issues only affect users of PasswordWallet 4.8.4 for Mac OS X. If you’re not running this version that has been out for only a few days, please ignore this message. You’ve placed your trust in us for 20 years of PasswordWallet. Nothing like this has happened to us before. We’re contacting you about this problem because it’s the only responsible course of action. Please accept our apologies. Our old upgrade method in the old PasswordWallet didn’t work right on Mac OS X 12, Sierra. Good news: We were able to fix it server-side, so just check for updates again from the “PasswordWallet” menu, and all should be well! While this issue didn’t affect all users, it did affect some of you. So thank you for your patience as we figure out the idiosyncrasies in the new OS! If you’ve had trouble with Touch ID in PasswordWallet on iOS 10, upgrade on the iOS AppStore! Apple approved our fix today, and users are telling us it’s working.